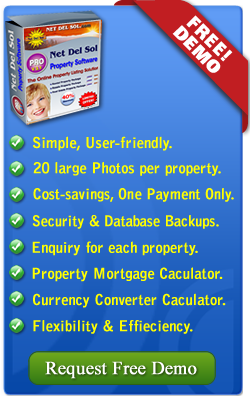 * Are you a Real Estate or Freelancer and need a reliable Property Listing Software? * Are you bored of your old property listing software and need a modern and state of the art software? * Are you financially tired of the overhead monthly fees that you are paying for your listing software and still you do not own it? Miravision proudly presents in cooperation with software developer Net Del Sol your solution! We provide you with the complete REAL ESTATE PACKAGE at an affordable One-off Payment, where you can get a Real Estate Listing Software to be incorporated into your existing website or even as a brandnew homepage. Choose your preferred business type for either RENTALS (long let and short let), SALES or BOTH and we will give you the right powerful and elegant software solution with unlimited database to store all types of properties & plots which will be presented in an amazing, informative and eye catching way! The software is also supplied with a powerful search engine (Ajax) throughout the whole database with intuitive multiple choice search functions for every type of real estate website visitors to easily search through your portfolio. Try our “no obligation” demo version and watch the tutorial videos in HD for FREE! Don´t forget to enter your Miravision Code to make sure you´ll qualify for an exclusive and limited discount!